The upcoming album ‘Summer of Sorcery’, out May 3rd. 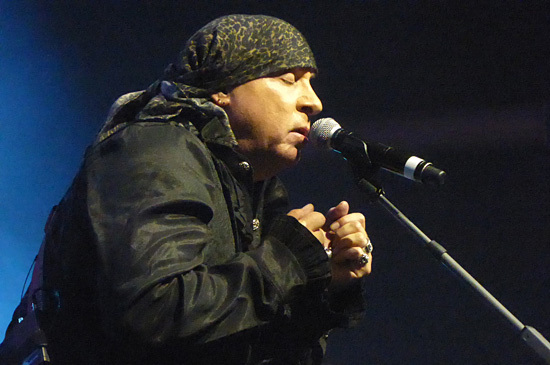 Steven Van Zandt’s and his Little Steven’s Disciples of Soul band performed a rare show at a smaller venue in the same complex as the Indigo at the 02 Arena. The longtime Bruce Springsteen collaborator and star of The Sopranos Steven Van Zandt performed his first London show for over 25 years at BluesFest . Two weeks ago came the unexpected and extremely welcome announcement that Little Steven and the Disciples of Soul were booked to appear at the show in London on October 29th, as part of the annual Bluesfest — and with the horn section . The remainder of the original material in the show broke down into several categories: songs from the Men Without Women album (“Forever,” “Inside of Me,” “Until the Good Is Gone” — not as many as expected); songs from the Freedom No Compromise album (“Freedom,” “Bitter Fruit”); songs written for the first three Asbury Jukes records (“I Played the Fool,” “She Got Me Where She Wants Me,” “Some Things Just Don’t Change,” “Trapped Again,” and “I Don’t Want to Go Home,” introduced as “The first song I ever wrote”); songs written for the Asbury Jukes comeback album Better Days (“Coming Back,” “All I Needed Was You”); plus “Ride the Night Away” (co-written with Steve Jordan and recorded by Jimmy Barnes and later by the Asbury Jukes) and main set-closer “Goodbye” (from the still-unreleased Lost Boys album project). In recognition of Bluesfest, the Disciples proved their flexibility and versatility by including covers of “Killing Floor” (Howlin’ Wolf, played in the style of the Electric Flag recording), “The Blues Is My Business” (Etta James), “Groovin’ Is Easy” (Electric Flag), “Love Disease” (The Paul Butterfield Blues Band), “Down and Out In New York City” (James Brown), “Walking By Myself” (Jimmy Rogers) and “Can I Get a Witness” (Marvin Gaye), the traditional encore back in the days of the original line-up. After two hours of high-energy rock, soul, funk and blues (New Jersey-style, by way of New York City and London, England), Little Steven and the Disciples of Soul took their final bows. It had been a triumphant return and a huge success, reminding older fans just how good Steven’s original songs are and introducing them to others who had previously been unaware of his musical life beyond the E Street Band. After this masterclass, the audience were thoroughly satisfied and perhaps just a little awestruck, could only stand around until security threw them out, talk about what they’d just seen and wish there was a late show, so they could do it all over again. It was nearly 1:30am, but nobody wanted to go home. This was the first Little Steven and the Disciples of Soul show in 25 years. No more are currently planned. “Thank you London, and everybody who came in from all over,” tweeted Steven the next day, “thank you for the wonderful encouragement last night. Very much what I needed.” He then celebrated the end of the Bluesfest weekend by attending the double bill of Jeff Beck and Van Morrison at the O2 Arena. Little Steven now appears determined to reactivate his long dormant solo career next year, after his commitments to Bruce Springsteen in Australia and New Zealand are complete (he has already said that he will not be leaving the E Street Band to pursue his own interests as he did in the ’80s). “I’ve ignored my own stuff too long,” he said recently. If everything goes to plan, 2017 will see the release of a new album and the re-release of Steven’s older recordings (possibly as part of a retrospective boxed set) in addition to a “proper tour” with the Disciples in the summer on both sides of the Atlantic. Time will tell whether the line-up will feature the same international blend or whether the Disciples will have a more American flavor next time. Given the prohibitive costs involved, it may not be possible to take 15 musicians on the road, so some trimming may be necessary. The setlist would also undoubtedly feature some changes, with fewer covers and more songs from the new album or from Men Without Women. If so, this makes Saturday night’s unforgettable London concert even more unique and the audience even more privileged to have witnessed it. thanks to Backstreets for the review.